Agency owners, agents, and other agency staff are constantly looking for better ways to do the things they do every day. The best agencies employ people who always push forward, looking for areas to improve. Improvement in any form hinges on knowing where to alter your behavior, and that usually relies on looking at what you’ve done in the past, what’s worked, what hasn’t, and what can be changed. Whatever the reason, your agency needs the right tools to “get at” the data they’re looking for. Otherwise, data analysis can be extremely frustrating and time-consuming; in a lot of these cases where they don’t have reporting tools, agencies simply don’t do much analysis because of the hassle. Therefore, they never have a good “pulse” on how the agency is performing. Arguably, as we said, the best way to forecast agency performance and set goals for the future is to see where you’ve been. It’s vital for agencies to use data to better understand the overall “health” of their agency at any given moment. However, some agencies aren’t tracking much data in the first place, so using data to answer questions about their agency is near impossible. Thus, many insurance agencies are going digital. 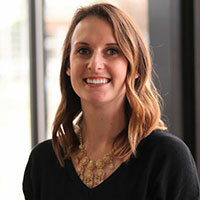 They’re using CRM (customer relationship management) software or, even more so, industry-specific AMS (agency management system) software to track their data, manage their agents, service their clients—basically do everything in their day-to-day. Within an industry-specific AMS, insurance agencies use reporting tools. Reporting tools, like AgencyBloc’s Custom Reporting, go beyond Excel spreadsheet manipulation to make pulling a report easy and quick. Without a way to “run” the report, agencies often find themselves knowing exactly what question they’d like to answer or what data they’re after, but with no idea of how to get it. So, what information are insurance agencies generally paying attention to when it comes to their operations? The breadth of what reports are used for in insurance agencies is extremely wide, from looking at year-over-year revenue growth to pulling a report for all leads that came in from your website lead form in the last 30 days. It can be for very high-level analysis to very granular data needs. This report looks at number of policies created this week, per agent. An agency owner can use this to monitor what their agents are doing each week, who their best performers are, and who they may need to reach out to to help. This report is used to identify specific areas that agents are qualified in so you can be sure certain leads get assigned to specific agents, depending on the need. This report is a quick snapshot of an agency’s day. It shows all of the activities relating to Individuals that day, like notes, assignments, updated due dates, completed activities, etc. This report will show an agency all of its Individuals that aren’t connected to a Group or Carrier, with no policies tied to them. This is used to easily identify potential sales areas or even to simply identify areas where data hasn’t been thoroughly tracked. This report gives an overall look at the employees within each group. Agencies use this information to track relationships within the groups, identify possible cross-sell opportunities, and view all active full-time employees. This report is an in-depth look into the group employees, their relations, and the policies they hold. With this information, agencies can view what the coverage is, who has it, and all who are covered under that specific policy. These are just a few examples of reports that can be built using a report builder. Let’s take a look at how agencies can build a custom report. The possibilities are endless for analyzing your data via reports if you’re thoroughly tracking your data and if you have access to a report builder. AgencyBloc’s Custom Reporting feature allows you to build reports with your data already in the AMS. From there, you can filter the data as much as you’d like and select the columns you actually want to see on the exported report. Say I want to see all of my Individuals who have a Health-ACA policy whose record has not been updated in the past month. My Report Type would be Individuals. 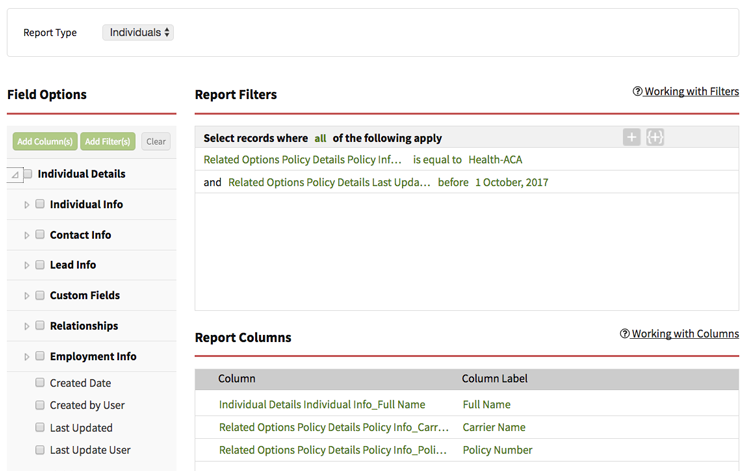 Then, I filter by “Health-ACA” policy and Individual record last updated before October 1, 2017 (based on the date I ran this report). The columns I want to see are the Individual’s full name, the carrier name, and their policy number. From here, I can preview the report and then download as an Excel spreadsheet or CSV format. Here’s another quick example. 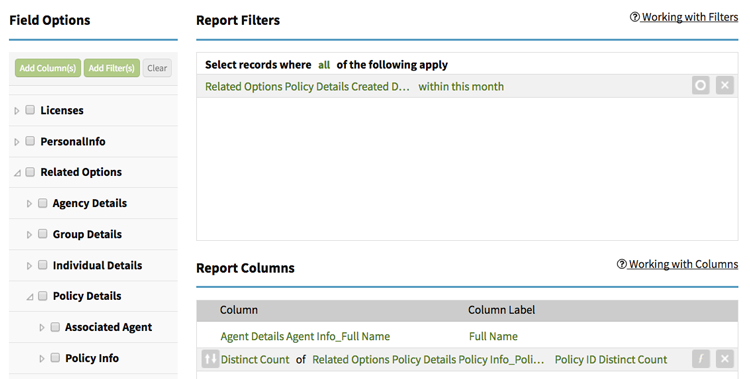 If I want to see agent production this month at my agency, I would search for/filter on policy details created within this month. 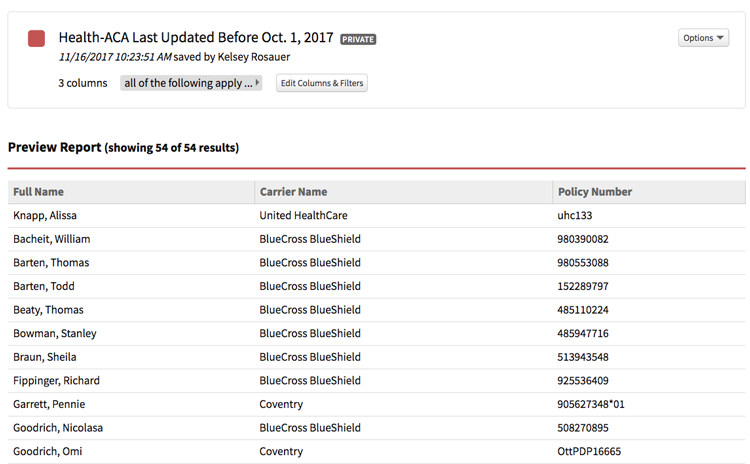 Here, an agent might appear twice, but that’s because this is counting policies per agent, per carrier. The above example was just policies per agent. Of course, you’re free to customize the filters and columns in any way you’d like with AgencyBloc’s Custom Reporting. These are pretty simple examples of the kinds of things you can pull up quickly via Custom Reporting. Although there are other ways to view data like this in AgencyBloc, like Advanced Search and Dashboard Analytics, sometimes you need a little more in-depth analyzation or something very specific. That is where many insurance agencies prefer using reporting tools. 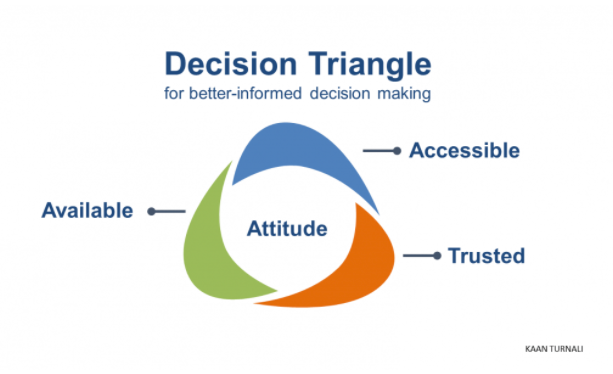 Overall, reporting allows agents, agency owners, and other staff to make better-informed decisions. No matter if it’s a small, granular pull of very specific information or it’s a year-end aggregate report of lots of data, it all helps agencies work smarter. Take a Look at Custom Reporting Yourself! You can take AgencyBloc's Custom Reporting for a spin by starting a free trial! You'll be able to see the reporting tools as well as the industry-specific CRM, business & marketing automation, and dashboard analytics.